Saint Christopher is one of the most popular patrons; of course, everybody knows a Chris. Interestingly, it is a purely legendary saint; it even seems that his name derived from his legend. Christóforos means “Christ-bearer”, and that is how St. Christopher was depicted: as a man holding Christ-Child on his arm or his back. It is a similar case as St. Veronica, who wiped Christ’s face on his way to Golgotha and was left with his image on her veil. The name “Veronica” in fact comes from latin Vera Icon, meaning “true image”. But let’s get back to St. Christopher: his medieval legends are like fairy tails! 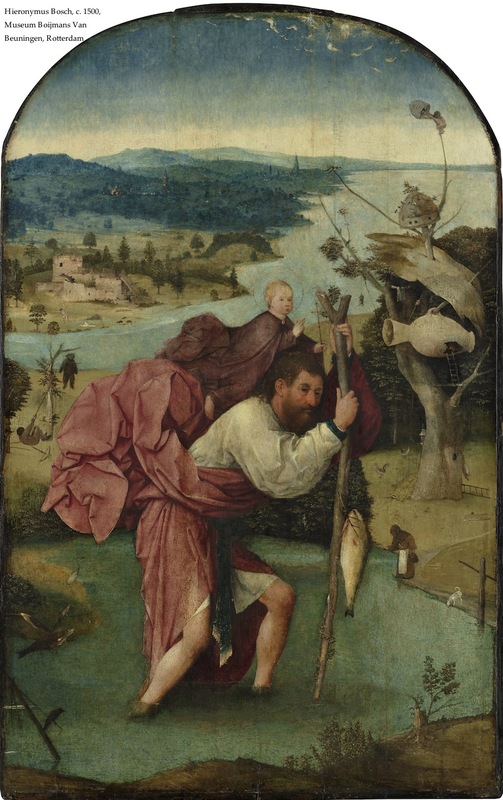 Apparently, St. Christopher was supposed to be… a giant! Medieval texts say that he was more than 23 feet tall (over 7 m) and very strong; it seems that we may link him with the mythological Hercules. St. Christopher was a great warrior and he wanted to serve the most powerful master of the universe. One day a hermit told him that the most powerful master and king would be Christ, but to serve him one had to help out other people. 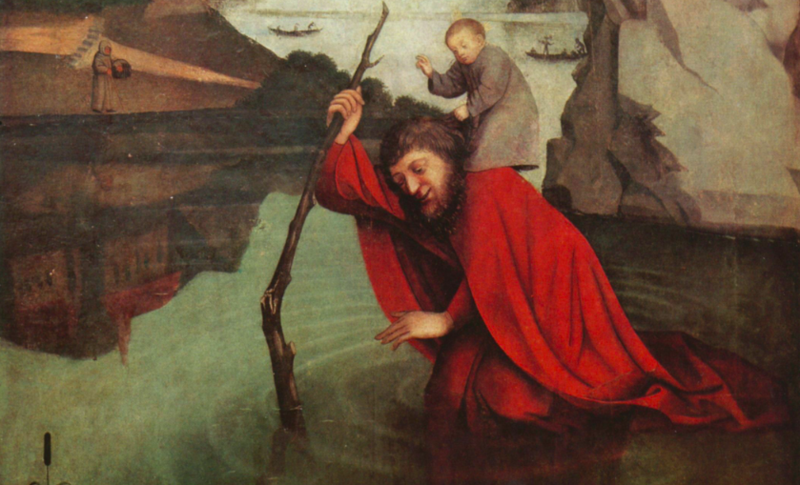 As a result, St. Christopher found himself an occupation he was really suitable for: he went to live by the river and helped travelers to cross it by carrying them through. It was really a good job for a giant… anyway, one day a small boy asked Christopher for help. When they were in the middle of the river, Christopher suddenly felt that the boy was extremely heavy and barely managed to carry him to the other side. But he did – and afterwards he told the boy: “I thought I was bearing the whole world!” The child answered: so you did, and also you bore its maker! Of course, that boy was Christ. You think that the saint-giant is rather a fabulous creature? Well, how about a saint with the head of… a dog!? That is another fascinating aspect: according to some legends, St. Christopher was a cynocephalus (kynokephaloi), which means he had a dog-head. It was believed in ancient Greece that such creatures lived somewhere East (Alexander the Great was supposed to have met them). It probably derived from Egyptian images of some gods, e.g. Anubis (god of the dead, depicted as a man with a canine head). As a result we may see St. Christopher as a dog-man, especially in some Orthodox icons. But let’s get back to the traditional Western depictions, as they have one more interesting aspect. In the Middle Ages it was widely believed that the images of St. Christopher have apotropaic qualities: that is a kind of magical power. 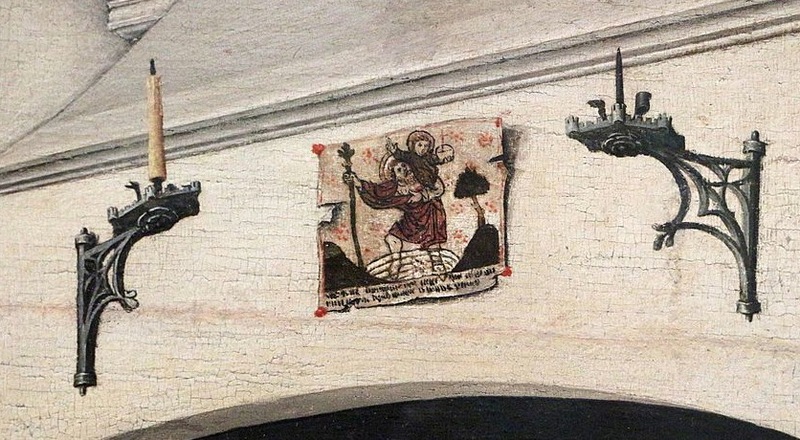 In this case it was a power of protection: whoever saw the image of St. Christopher, was protected against violent and sudden death till the end of that particular day. As a result, it was a smart idea to put St. Christopher’s image somewhere at home, where we could have seen it as soon as we got up in the morning. 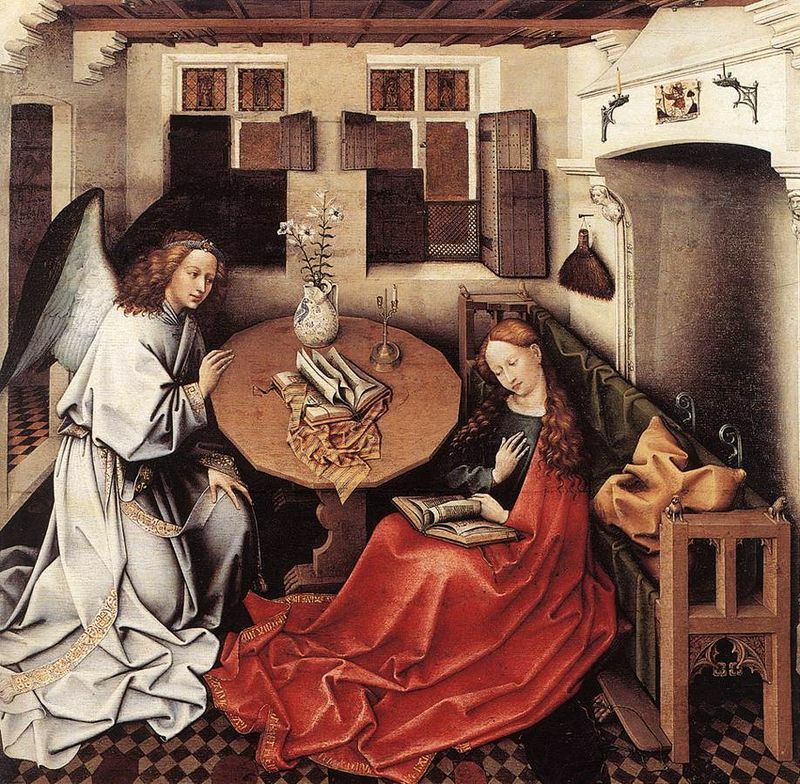 There is an interesting proof of such an attitude: the Annunciation by Master of Flémalle (ca. 1425-1430, Brussels, Musées Royaux des Beaux-Arts). The scene is placed in the bourgeois interior and so we can see the image of St. Christopher right above the fire-place! Of course, the magical powers of St. Christopher may have been used on a massive scale. 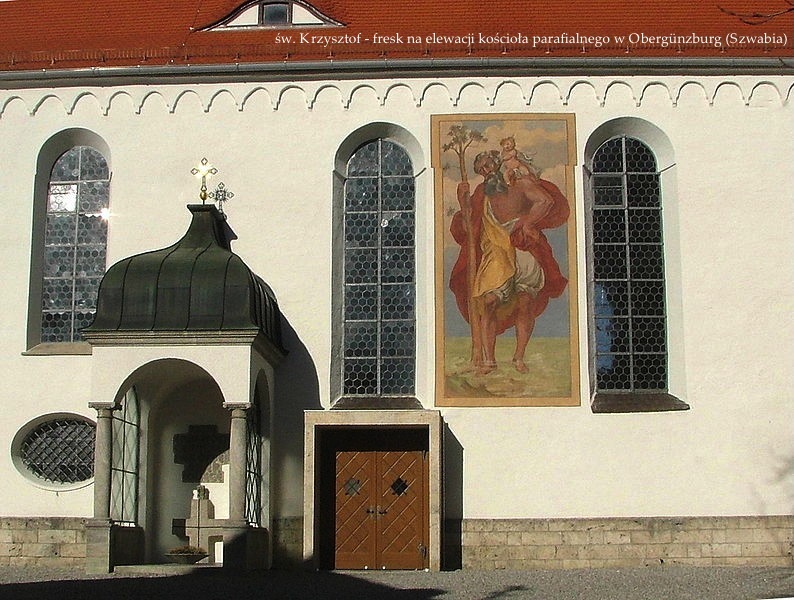 That is why it was popular to place his huge images on the elevations of houses and churches, so everybody going to the market place could have started a day by seeing this saint and feeling safe for the rest of the day. St. Christopher is a patron-saint of the travelers – not only because he carried people through the river, but mostly because he protects from the sudden death. That is why he is a patron-saint of the drivers and his image is so popular as a decoration of the car-keys. We must remember though that Saint Christopher does not endure any speed; some say that he stays by our side as long as we do not violate speed-limits. If that happens, his place is taken by St. Peter, ready to open the Heaven’s gates for us.